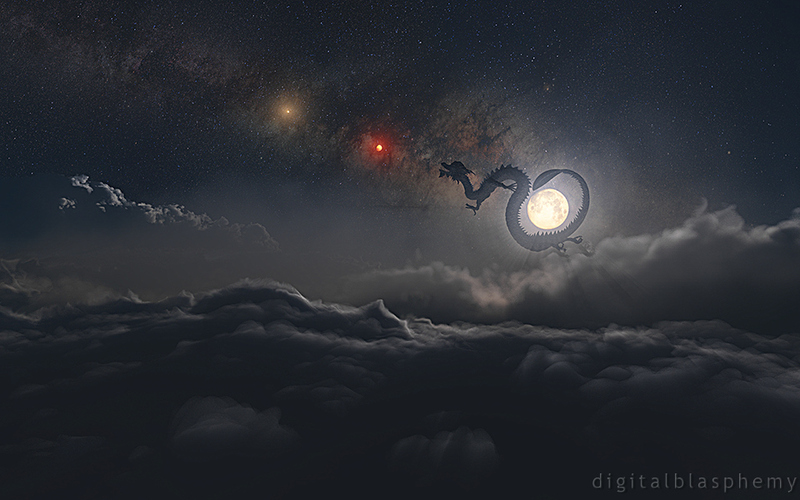 Quite a few people asked if I could create a night version of Year of the Dragon. Hope you like it! I thought you could've mixed in a bit more color, it seems a bit bland with all the grey. I thought perhaps it could use a bit more dark blue. But it's still a great image (using it for my laptop now). I was born in the year of the Dragon. Fantastic work. It wouldn't be "Year of the Dragon" without a dragon. Keep the dragon! The "Mona Lisa" has an interesting background. Do you suppose Da Vinci painted a version without the lady with "La Gioconda" smile? "Could I trouble you with..."
You definitely made the right choice by keeping it simple. I have to ask, perhaps I'm the only one to notice this but, was it intentional or coincidence that the cloud on the far left, centre vaguely resembles a dragon? The head and open mouth facing at almost the same angle and direction as the Dragon itself. This could be just what my eyes see of course. Either way, very cool! The day version I loved but this is epic. Something so serene and enchanting about it. You have knocked another one out of the park Ryan. Great job on Year of the Dragon (Night)(2012). Keep up the great work! Ryan, I believe the night version is the best. Great job! "Year of the Dragon (Night) (2012)"
Now, that's what I'm talking about! Well done Ryan. The multiscreen is rendering now. I pulled the camera out so there should be more clouds than the day version (which I will also redo at some later date...). I *REALLY* want this one in triple. Definitely the better version...! Very nice work, sir. I love this one. It turned out better than the original, IMHO. While we're touting Mr. Musks's accomplishments, don't forget about Tesla. Wonder what could be done with that...?? I can't wait to see the multiscreen renders of this one! 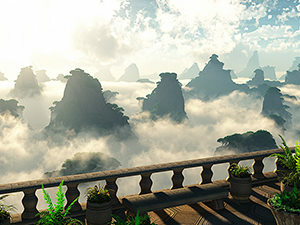 I don't know how it would be possible, but I hope that there will be more of the clouds in the dual-screens than with the original "day" version. And easily as good as the original gallery version. Thanks to Ryan, I'm now a big fan of the "Year of the Dragon" series, Elon Musk, SpaceX, and the Dragon spacecraft -- even before MSL Curiosity has had a chance to settle into its new Martian home. Now that left me speechless. Awesome render, Mr. Bliss! Any chance we could get a night version of the pickle jar titled "Dragon Year First Clouds 1?" I love the night sky. I love magical Asian dragons. I love clouds. Like many of the best DB works, its scale is ambiguous and it can be taken as grand or whimsical or both. Quintessential Ryan Bliss. It is for this type of piece that I am a member. "Year of the Dragon (Night)"
I like this one more than the day version! Very nice! Nice work! Thanks for doing the communities request! Any chance of dual screen? Ryan, your "Year of the Dragon" link in the parent post is broken. Just thought you'd like to know. Feel free to delete this post once you fix the link. No reason for other people to be confused by it. Love the placement of the moon. Both wallpapers are awesome!